Supply chain refers to a chain which keeps producer on one side and users on the other side and the activities associated with flow of goods and services. This activity starts from the step 1 that is formation of raw materials into goods and services to the delivery of the final product. It involves the movement and storage of goods and services from point of origin to the point of consumption. It is defined as, "design, planning, execution, control, and monitoring of supply chain activities with the objective of creating net value, building a competitive infrastructure, leveraging worldwide logistics, synchronizing supply with demand and measuring performance globally." Management of Supply chain is important as the managers are able to cut excess cost and able to deliver the products to the customer faster. Every product that comes into the market is the result of the efforts of organizations which are interrelated to each other. For example- To produce Laptop, company needs hard disk, body and other important parts, which may not be manufactured by the same company. So, they procure these items from other companies. This process of procuring raw materials from other companies also comes under the supply chain management. It has existence since a very long time but businessmen haven’t paid attention to it but recently they have understood the importance of this and paid high attention to it. Company makes sure that they keep a tight control on the internal productions, inventories, sales and inventories of company’s vendors. They focus mainly on customer satisfaction and competitive advantages. It involves the transformation, movement and storage of goods and materials. It is the visible piece of the supply chain. 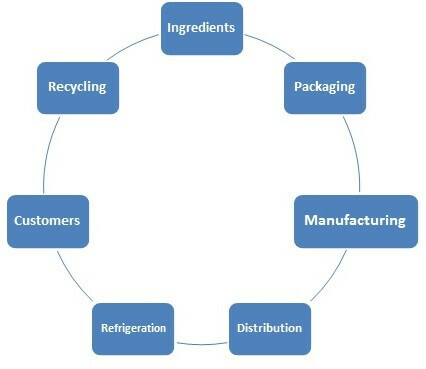 The following diagram illustrates the process of flow of material in a supply chain. Customers expect the product to be delivered to them in right quantity and this is made sure by the company’s supply chain management that a consumer is getting what he wanted. Customers need availability of the products, if they do not get it, their satisfaction level decreases. Due to the decrease in the satisfaction level of the customer, business image in the eyes of the customer will also decrease. So that’s why SCM is important for the company. Customers expect the company to deliver the product at a right time. For example- if in India, one person booked a car and if that individual doesn’t get it on the promised delivery date then he will feel ignored and will not return to purchase from the company next time. After sales service of the product is equally important as a product. For example- customer is not efficient enough to install air conditioner on his own. Decrease purchasing cost: Inventory cost matters a lot for the retailer. And he makes sure that he doesn’t need to maintain a high inventory because if the inventory is more than that should be kept then it would increase the cost of keeping the inventory. So, retailer depends the supply chain to deliver the product on time so that he can keep the purchasing cost low. Increase in profits for the company: Mostly firms value the Supply chain managers because they help in controlling and reducing supply chain costs. When there is a decrease in the cost, it will have an impact on the profit of the firm. U.S. consumers eat 2.7 billion packages of cereal annually, so decreasing U.S. cereal supply chain costs just one cent per cereal box would result in $13 million dollars saved industry-wide as 13 billion boxes of cereal flowed through the improved supply chain over a five-year period. Increases the cash flow of the company: Organization values the Supply Chain Managers because they speed up the process of transferring of goods to the end users. Due to this, company will be able to generate the invoice early, which means the company will receive payment from the customer early. Sustains human life: Human beings require necessity goods to live. They require water, foods clothes etc, if these will be stopped coming then the human beings might face a crisis. Human healthcare- Sometimes it can become a difference between life and death of a human being. Humans depend on supply chains to deliver medicines and healthcare. For example- if an individual need immediate transfer to some other city for some medical emergency and helicopter isn’t available, then it may cause death to him. Supply chain management also helps in creating job for the individual. Supply chain management has various activities which require human force such as transportation, warehousing, packaging and logistics information. So, there are many jobs available in the supply chain field. a) Inventory Management System- Organization can install Inventory management System which will keep them updated with the various aspects of the inventory decisions. Decisions like when to repurchase inventory, what is the upper limit of inventory etc. can be ascertained through inventory management system. b) Storage space- Firms storage space can be managed easily by the supply chain management which will help the firm in saving the finished goods from damaging. SCM can help raise Output. Supply chain management is designed in such a way that improves communication, coordination with vendor transportation and shipping companies. The streamline & centralized distribution strategy of supply chain management software make it more reliable for end users and give more accurate output results. SCM can minimize delays. Company needs raw material to produce the final product. And if there is any delay in procuring raw materials then company would have to stop the production for a limited time period. And this stoppage would increase the cost of the company, as the fixed cost of the company would keep on increasing irrespective of the usage. So, supply chain management makes sure that right inventory is kept in the organization. SCM can help firms provide Good Customer Service. After sales service is as important as the price of the product and customer should not be disappointed on this ground. Supply Chain Management makes sure that after sales service is provided to the customer. Plan- Planning stage of the Supply Chain Management is the first step of the process. To satisfy the needs and demands of the customer, planning of a strategy is most important. Objective of this stage is to yield maximum profit for the organization. For managing all the resources required for designing products and providing services, a strategy has to be designed by the companies. Supply chain management mainly focuses on planning and developing a set of metrics. Source- In the first stage, planning has been done. Now it is the time for the company to develop relations with the other parties, in other words you can call it a stage of sourcing. In this stage, company mainly focuses on developing a relationship with suppliers. In this stage, decision is not just taken for identifying dependable supplier but also method for shipping, delivery and payment of the product. Now a company makes a list of the suppliers and the methods which could be used with them. Then they evaluate all the suppliers and find the one with the best price. Finally, the supply chain managers can combine all these processes for handling their goods and services inventory. This handling comprises receiving and examining shipments, transferring them to the manufacturing facilities and authorizing supplier payments. Make- Making of the products which are demanded by the customer falls in this stage. Products are tested, designed, packaged in this stage. Supply manager’s task involves activities which are required for manufacturing, testing, packaging and distribution. In this stage of Supply Chain Management process, firm can check out the product’s quality, production output, and worker’s productivity. Delivery- It is the fourth stage and in this stage, products are delivered to the ultimate users, i.e. customers. It is generally a logistic stage, where customer orders are accepted and delivery of the goods is planned. Return- It is the last stage of the process, in this stage, damaged product, defective product is returned back to the supplier. In this stage, dealing with customer’s queries and complaints is done. This is the complicated stage as in this stage; dealing with the customer must be done in a careful way. CISCO eliminated the paper purchase orders and invoices which helped in reducing the time and communication had been done easily. It benefitted the company by reducing the cost and 90% of the sales are made over Internet. Expensive: Supply Chain Management is expensive. Thus, it will increase the cost of the product and the benefit will also be derived in long run. Supply Chain Management can be copied by the competitors too as it is not very difficult to adopt. It cannot be done by any personnel. It requires special skills and talents from the side of the employee. Supply chain management consists of different functions and sometimes it becomes difficult for the organization to manage all the functions together. As it is a task which requires skills, talents and time from the side of the employee, they might not easily adopt the system. There is ab increasing need for business students and MBA graduates and executives to understand the challenges of supply chain management in global organizations such as supply issues, operational issues, supply chain effectiveness and role of locations and customers in creating supply chain networks. Students are also required to study aspects related to Logistics and Distribution Management such as aligning logistics with overall business development in global pipeline, coordinating logistics to ensure custom value experiences, risk management and decision making to reduce supply chain problems. There is also a detailed study of Operations Management for quality management and creating lean systems with total quality management principles and emphasis on product and service design as well as project management. Inventory management, warehouse management and inventory forecasting is also important for effective supply chain with purchasing functions and vendor management through formal relationships. Analytical methods are involved in evaluating purchasing effectiveness. Physical flows and information flows to support warehouse operations as well as packaging and handling in warehouse management with warehouse risk management are other core issues studied in SCM courses. A course in supply chain management (SCM) and logistics covers areas like planning and managing activities involved in sourcing, conversion, and logistics management as well as the information systems. These courses are meant to provide students a deep understanding of areas like negotiation of agreements and contracts with remote employees and suppliers, procuring inventory, risk management, global supply chain creations, total quality management, maintenance, transportation of materials, facilities and human resources as well as operations management and decision making under risk and uncertainty. In SCM, the assignments are designed to be relevant to real-life work place problems and challenges such as interviewing supply chain professionals, identification and evaluation of suppliers and vendors, developing leadership and business communication skills, problem solving as well as understanding concepts of international marketing, globalization, diversity and multiculturalism as well as real case studies based on operations management, warehouse management, risk planning as well as inventory management are also given. If you are searching for the best and reliable online tutors for supply chain management assignments and assessments in logistics and distribution management then www.assignmenthelp.net is your best bet. Our online SCM tutors are industry professionals with business degrees and certifications from leading universities of management and business schools from USA, UK and Australia around the world. Be it any kind of assessment in supply chain management, assignments, term papers, supply chain management research essays, custom business report writing, SCM case studies and homework problems, our online management tutors are available 24x7 online to help you ace the supply chain management course. So, if you are looking for help with your supply chain management assignments, contact our live chat service and get a free assessment of your SCM assignment.